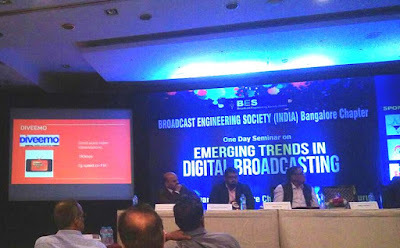 Various aspects of Digital Radio Mondiale technology was discussed and Demonstrated during one day seminar 'Emerging Trends in Digital Broadcasting', organized by Broadcast Engineering Society, Bangalore Chapter on 3rd Feb 2018 at Hotel Chancery Pavillion, Bangalore. Over 100+ delegates including students, faculties attended the seminar. Rajesh Kurian from NXP, Bangalore outlined the features of DRM including specifics of modulation standards, DRM coverage areas alongwith various other technological aspects. He also demonstrated live reception of Digital Radio Mondiale transmission from All India Radio, Bangalore. Gowrav L. Director, Geek Synergy Technologies, presented about possibilities in DRM non audio services including data application services in DRM+ and Diveemo. The seminar was inaugurated by Hon Minister for Transport, GOK,Shri H.M.Revanna. Keynote Address was delivered by Chairman of Bangalore Chapter Shri Anil Kumar Mangalgi, DDG(E),DDK,Bangalore.